For centuries and still today, gold has been the standard by which we determine worth. Made of ingredients worthy of the finest cocktails with the gold standard among jiggers. Each side a perfect cut of richly grained rosewood, this slim rectangular flask accommodates a three-ounce pocketful of firewater. Curious how even the best liquor tastes better from a golden flask? 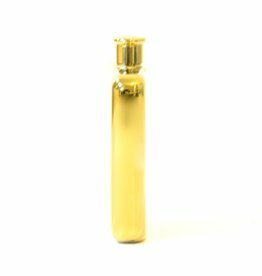 Ours is plated in 14-karat gold, with a liquid tight lid and 6 oz capacity. Raise a toast to living in a Golden age. A Gold Pitcher Perfect for Hosting.